Ukraine’s hottest TV show — the political satire Servant of the People — has spawned a feature-length film. A followup to the show’s first season, Servant of the People 2 screened for international film enthusiasts last week at the Montreal World Film Festival and is now available for free, English-subtitled streaming on YouTube. 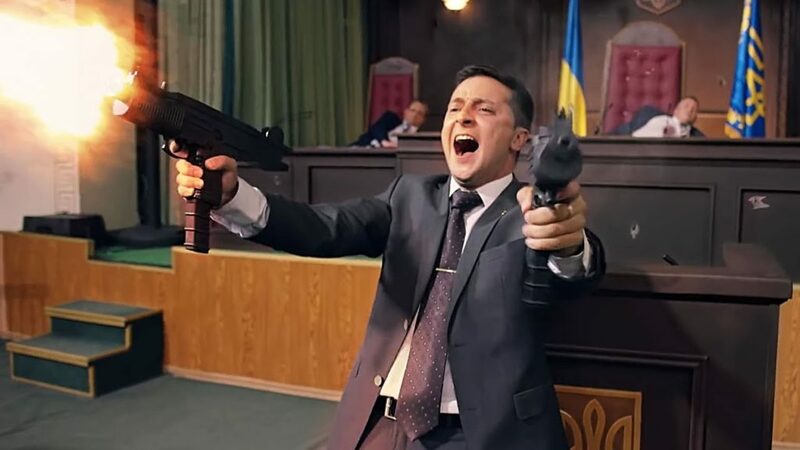 For those who haven’t read our piece on Servant of the People, the show is a political comedy in which an everyday schoolteacher named Vasily Petrovich Goloborodko unexpectedly becomes President of Ukraine. Honest to a fault, Goloborodko recruits a cabinet of fellow outsiders. Together, they use humorously creative methods to battle Ukraine’s corrupt entrenched interests, which include Goloborodko’s own Prime Minister Yuri Ivanovich Chuiko and a shadowy coterie of oligarchs. The Servant of the People 2 movie picks up right where season one of the show (available for streaming on Netflix) leaves off. President Goloborodko has jailed former Prime Minister Chuiko for his manipulations, but new challenges await. With the help of his Foreign Minister Sergey Mukhin, Goloborodko must acquire a IMF fiscal aid package in order to stabilize Ukraine’s finances. However, the IMF needs Goloborodko to pass certain reforms first — reforms that the meddling oligarchs have instructed their corrupt parliamentary cronies to block. Backed into a corner, Goloborodko makes a deal with former PM Chuiko — in exchange for helping take down the oligarchs, Goloborodko will let Chuiko leave the country. The two unlikely allies proceed on an amusing journey across Ukraine to strike at each oligarch’s weak points, whilst Foreign Minister Mukhin holds the stuffy German IMF representative at bay with drinking games. I’m naturally wary of sequels, but Servant of the People 2 held up to the standards of the original Servant of the People. The film’s jokes continue to be accessible for non-Ukrainians, yet also retain a distinctive post-Soviet flavor. For example, there are plenty of uproarious corruption-centered gags that you’d never find in a Western drama, but are still easy for Westerners to understand. Perhaps being the sequel of a serialized TV show makes this easier, but Servant of the People 2’s plot also felt quite fresh… especially compared with the endless superhero sequels that Hollywood makes. One big contributor on this front is how the movie shows many parts of Ukraine outside of Kiev — Kharkiv, Odessa, Lviv, and more — and bases certain plot points on actual instances of corruption (ex. unfinished bridges) in these locations. We also learn more about the shadowy oligarchs, who for most of season one didn’t even show their faces. At just over 1.5 hours in length, Servant of the People 2 provides a lot of entertainment value in a rather light, easygoing format. It contains car chases, gunfights, and yacht rides… not to mention an incisive undercurrent of political commentary on Ukraine’s situation. Even if you’re not interested in politics, or didn’t watch Servant of the People season one, this movie is an enjoyable romp that you could easily watch on a weekend night. Servant of the People 2 (Russian: Слуга народа 2). Ukraine. Dialog in Russian and Ukrainian. First released December 2016. Running time 1hr 37min. Starring Vladimir Zelenskiy, Stanislav Boklan, Evgeniy Koshevoy.